Eating more berries may significantly reduce the risk of developing type 2 diabetes, according to a new review. 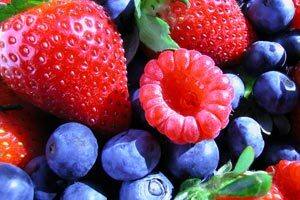 Analysis of 8 studies shows that high dietary intake of berries lowers the risk of type 2 diabetes by 18%, compared with the lowest intake. Anthocyanin, a plant compound that gives fruit and vegetables a pink, red, blue or purple hue, reduces risk by 15%. Blueberries, cherries, prunes and radishes contain anthocyanin. The researchers found a dose response, with the risk of type 2 diabetes dropping by 5% for every 17 g/day increment of berry intake and every 7.5 mg/day increment of anthocyanin. Three studies reporting anthocyanin intake were included in the analysis, contributing over 200,000 participants and 12,611 type 2 diabetes cases. For berry intake, researchers used 5 studies including just over 194,000 participants and 13,013 cases of type 2 diabetes. The researchers say theirs was the first study to look at the links between anthocyanin and berry intake with diabetes risk. They highlight 3 possible ways anthocyanin might reduce risk. These were its antioxidant effect, its anti-inflammatory action and its effect on glucose metabolism and lipid equilibrium. “Supplementation with antioxidants has been shown to reduce type 2 diabetes risk via regulation of inflammatory response, reduction of blood glucose and insulin resistance,” the researchers write. Other foods that contain anthocyanin include eggplant, currants, red cabbage, grapes, red onions, black rice, potatoes, bananas, pears and peas.